Below is the movies that were screened during SFGE 2016. He didn’t find his dreams… his dreams found him. Alex Rogan is a small town teenager with big time dreams. Dreams of college… of success… of marrying his girlfriend, Maggie. He’s just like everybody else, except Alex has a very special talent… that no one on Earth can appreciate. But, tonight, a mysterious stranger has called on Alex. He’s come from a galaxy that’s under attack from an alien force. And Alex’s unique ability is their last hope. The star of this film, Lance Guest, appeared at SFGE 2016! The most unofficial and unauthorized Nintendo documentary ever! The rules are simple: 30 days, 678 games. No online purchases. 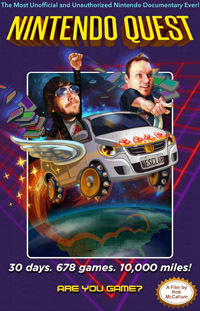 Follow video game rock star, Jay Bartlett, a fanatic collector over 10,000 miles as he pursues his dream to own a complete official North American NES library. Along the way, Jay’s best friend, and filmmaker Rob McCallum examines the enduring legacy of the NES and the power of Nintendo culture. Out of the closet and into the arcade! 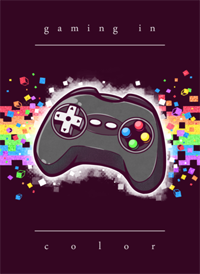 Gaming In Color is a feature documentary exploring the queer side of gaming: the queer gaming community, gaymer culture and events, and the rise of LGBTQ themes in video games. Diverse queer themes in game storylines and characters are an anomaly in the mainstream video game industry, and LGBTQ gamers have a higher chance of being mistreated in social games. Gaming In Color explores how the community culture is shifting and the industry is diversifying, helping with queer visibility and acceptance of an LGBTQ presence. After spending countless hours driving to visit his daughters on weekends and holidays, Randall Hoyt, a professor of Graphic Design, decides to put his knowledge of how to drive like a shark to some use. 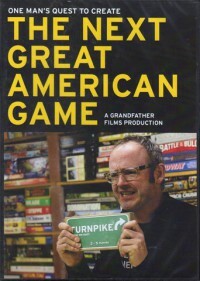 So he spends five years creating a tabletop board game called Turnpike. The film takes a deeply personal tone as Randall candidly discusses his struggles with bi-polar disorder and the intersections of mania and creativity. It turns out that, inspired by his time in bi-polar rehab and group therapy, Randall has designed another game, Talk and Listen, designed to foster communication and collaboration. When veteran designer Mike Fitzgerald sees this dice game, he calls it gold, pure gold. 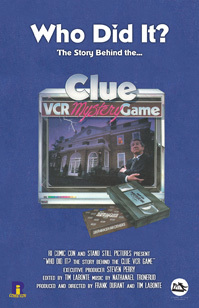 In 1985, Parker Brothers produced the CLUE VCR Mystery Game for VHS. Filmed in Massachusetts, it would cast a group of unknown actors to portray the iconic CLUE characters such as Col. Mustard and Professor Plum. While most productions were filmed in Hollywood and New York City at the time, Parker Brothers took a chance and broke the mold by filming with New England based talent. At the time, it became the most successful video board game of its time, revolutionizing the medium of VHS and video gaming. A few years later, Nintendo and Sega would hit toy stores across the country and the VHS began to fade away as the gaming industry quickly changed. 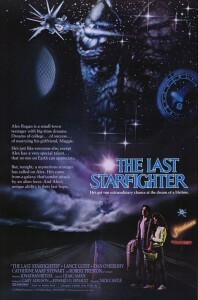 30 years later, the cast and crew reunite to tell the tale which many have forgotten. The trail blazers that helped change the toy market and the actors who put Boston back on the map as a destination for filmmaking, each give their personal and professional opinion on the importance of what the CLUE VCR Mystery Game was all about. 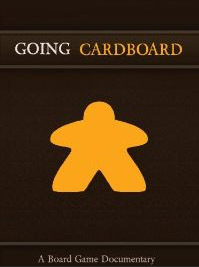 Going Cardboard is a film about the new board gaming, a phenomenon going on right under your nose, probably in your very community! This film will take you into that world to meet the players and designers responsible for this radical departure from technology. And you just might discover it’s the hobby for you. Be warned; there’s a significant risk that after seeing Going Cardboard, you, too, will feel compelled to begin your own modest little board game collection.